We’ve all been in this situation before; bored at home with an itch to bust open some packs. So we run over to the local card shop hoping to strike gold in the form of cardboard. We scan the packs available and pick a few here and there. We find an autographed card every few packs and the vast majority of the time, the reaction goes something like: “Who’s that? 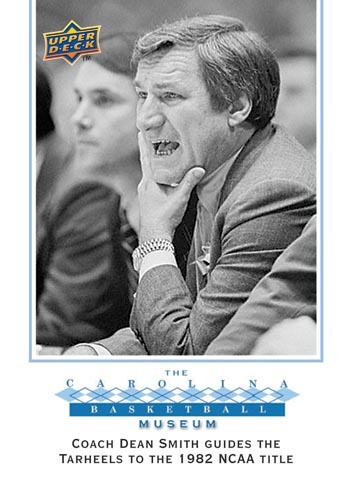 ?” Then we go home and try to find out who this guy is whose signature we now own. After which we check out the completed listings on eBay hoping that we might be able to sell the card for at least the price of the pack only to find out that our new card is selling for the dreaded $0.99 plus shipping. I rushed home, turned on the computer, and checked out eBay’s completed listings and found my Swagerty autographs ending at around $60. Had I finally got lucky and pulled a highly touted prospect?! I quickly found that there isn’t anything particularly special about Jordan Swagerty as a baseball player. 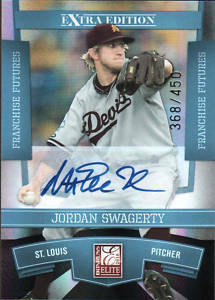 My cards are only valuable because it is not Jordan Swagerty’s autographs on them. It was some guy named Magic Johnson. 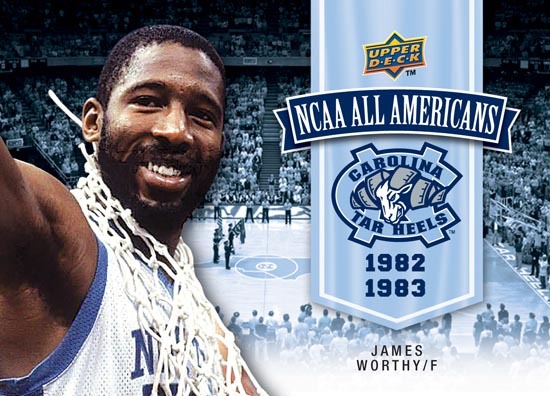 My “Who’s that?” autographed cards had just turned into the cards of a Hall of Famer and one of the best basketball players ever. My $4 cards (including shipping) had turned into $40-$75 cards. It wasn’t quite striking gold, but compared to my recent cold streak, it came pretty close. It turns out that Panini has made one of the strangest mistakes in the hobby’s history. 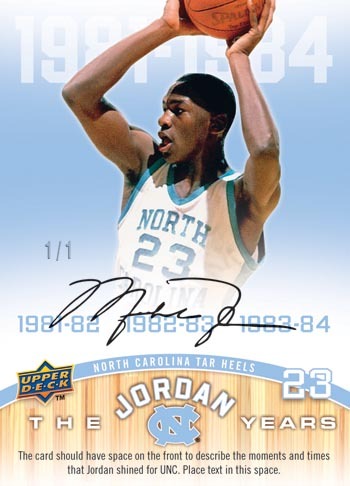 They have mistakenly applied Magic Johnson’s sticker autographs to most, if not all, of the 905 Jordan Swagerty cards in this year’s Elite Extra Edition product. Panini has publicly apologized for the mix up; “It’s an extremely unfortunate – but honest – mistake and we can’t apologize enough to collectors,” says Panini’s marketing manager, Scott Prusha. “What we can do, however, is what we always do: Atone for our mistake and make things right for collectors.” Panini has already set up a system to correct the error through their website. Collectors who return the Magic Johnson version of the card will receive the correct version of the Jordan Swagerty card, plus an exclusive 2010 Elite Extra Edition card of top prospect Manny Machado. As generous as Panini’s offer is, I don’t know of anyone who would prefer the autograph of a 21-year old pitcher selected in the second round of the 2010 amateur baseball draft over the autograph of Hall of Famer Magic Johnson. However, there are several collectors who put together the entire autographed set every year. Will they trade in their Magic Johnson autographs? 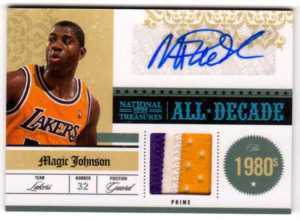 If Magic Johnson went to Michigan State, why is he signing the Arizona State Collegiate Patches cards? This brings up the question of how the Collegiate Patches cards are manufactured. It must be that the ASU logo was sewn into the fabric after Magic Johnson signed the card. The Collegiate Patches cards are generally quite popular among collectors. Would this information affect their popularity? Before the release of 2010 Elite Extra Edition, there were 989 different Magic Johnson certified autographed cards in circulation, most of which are serial numbered lower than 25. With the sudden flood of 905 autographs into the market, will value of Magic Johnson autographs decrease? At the moment, the Swagerty error autographs are selling for nearly as much as Magic Johnson’s correctly autographed cards. This is not the first time that an autograph has been affixed to the wrong card and Panini is not the only company to have made the same mistake. However, the “Swager Magic” error, as many collectors are calling it, is obviously a much more costly error, as Magic Johnson clearly demands more to sign than Jordan Swagerty. It is yet another strike against the widely hated sticker autograph. Collectors hate stickers primarily because the signer never physically possesses the card, but there have been errors in placing the stickers upside down as well. Despite protest from collectors, card companies have continued to use stickers to attach autographs to their cards. Since this particular error sticker autograph has cost Panini thousands of dollars rather than the collectors, maybe the card companies will finally begin phasing these stickers out and switch to the much more popular on-card autographs. It is an unlikely consequence, but it is still nice to see the card companies have to pay the price for sticker autographs rather than collectors. Print article This entry was posted by Pheebs888 on October 26, 2010 at 2:40 pm, and is filed under Hobby Articles, Hobby News, Panini. Follow any responses to this post through RSS 2.0. You can skip to the end and leave a response. Pinging is currently not allowed.